Apple's latest 9.7-inch iPad 32GB is now on sale for nearly 30%. The tablet usually sells for $400 on Apple's website, but there are plenty of deals out there that will allow fans to buy it slightly cheaper. 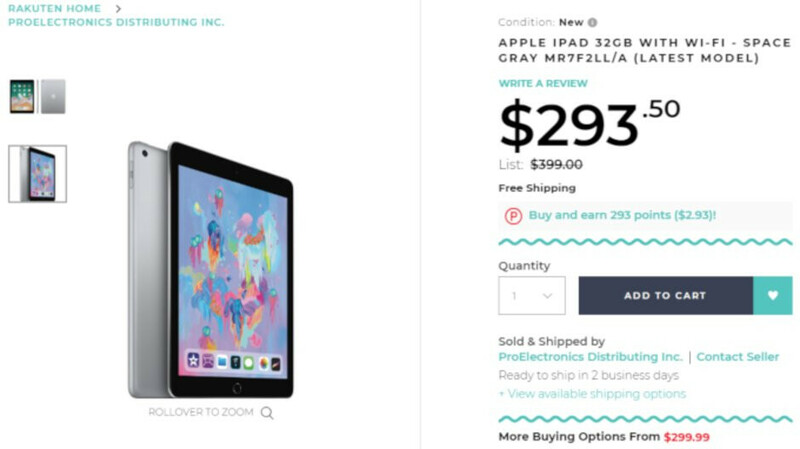 Pro Electronics offers the 2018 9.7-inch iPad less than $250 for a limited time. If you're interested in their deal, you'll have to visit Rakuten's online store and place your order. However, be sure to apply the code SAVE20 at checkout, which will get you another 20% discount. Although it's not as good as the Black Friday deal available last month, it very close so it's worth a look. Keep in mind that the price is for the Wi-Fi only version of the 2018 9.7-inch iPad with 32GB onboard. Customers who order the tablet won't be getting it by the end of the year, but shipping is free. Team Phonearena! Do you guys think in some years, say in a decade, smartphone camera quality would match the image quality of today’s top tier cameras from Nikon and Canon(D850 and 5D mark iv )? Nope.. Beat entry-mid DSLR from this era? maybe... Beat top tier? nope.. Reason? Lenses and Sensor size..